What is “Quick Lay” carpet tile? “Quick Lay” carpet tiles can be easily installed without additional adhesives or floor sealers. 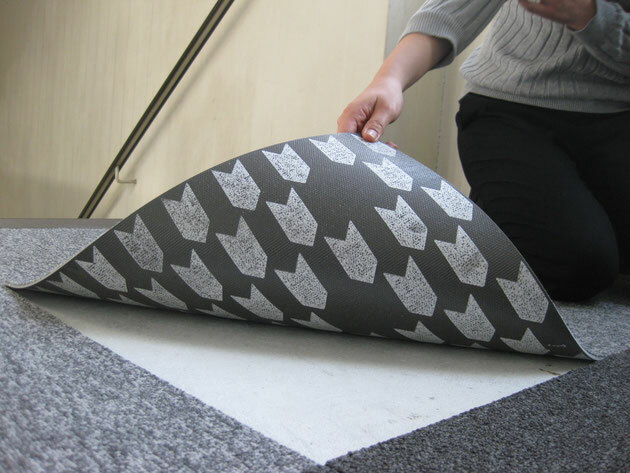 The carpet tiles require no, additional taping, or gluing processes. - No work required with adhesives, peeling off paper films or double sided taping. - The carpet tiles are easily released when they are taken out of the box. What makes “Quick Lay” carpet tile? Newly developed adhesive is applied during the manufacturing process of “Quick Lay”. The adhesive consists of acrylic resin foam and urethane resin. This combination makes the adhesion very strong, especially in the lateral direction. This makes the tile an excellent option for installing on floors with various finishes including highly polished surfaces.